The Barn is the largest of our gîtes, with comfortable accommodation on two levels and features a modern kitchen. The large double bed is on the gallery overlooking the living area, the bedroom off the gallery has two single beds and there are 2 shower rooms with toilet, one upstairs, one downstairs. 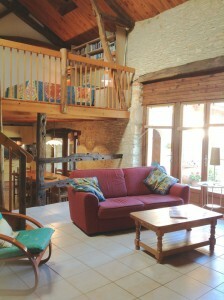 The Barn gîte is perfect for 2 people, but sleeps 4, or 6 to 8 if booked with the Tower. 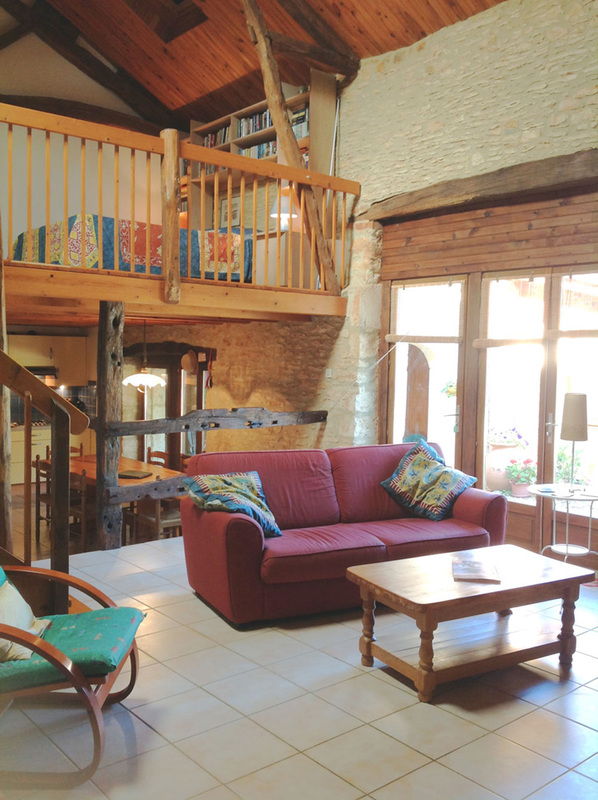 When combined with the accommodation in the Tower or the Breadhouse studio gîte, the total rental accommodation is for 8 to 10 people or more – in summer. 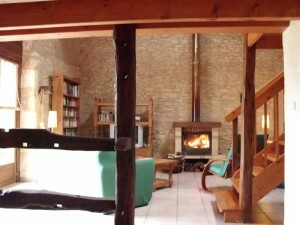 The Barn (only) is available all year round, with the log burner to keep you nice and toasty in winter. Roof windows which light the gallery and bathroom as well as the spacious two storey height main living area, creating a warm, bright atmosphere. 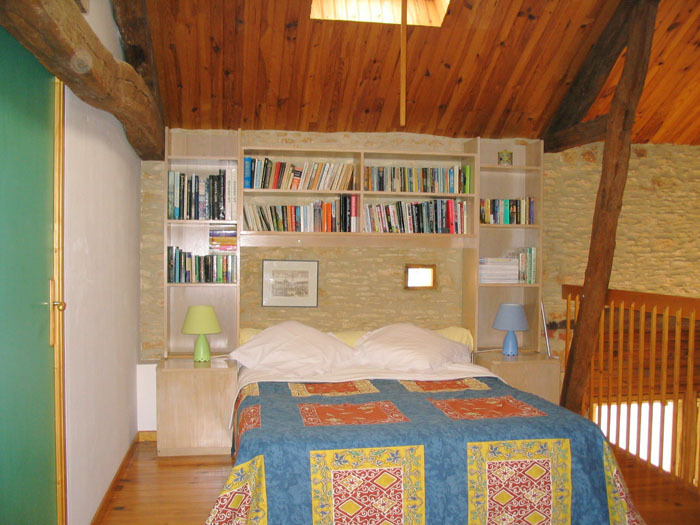 On the gallery overlooking the living area is the large double bed, bookshelves and a curtained wardrobe offering plenty of hanging and storage space. 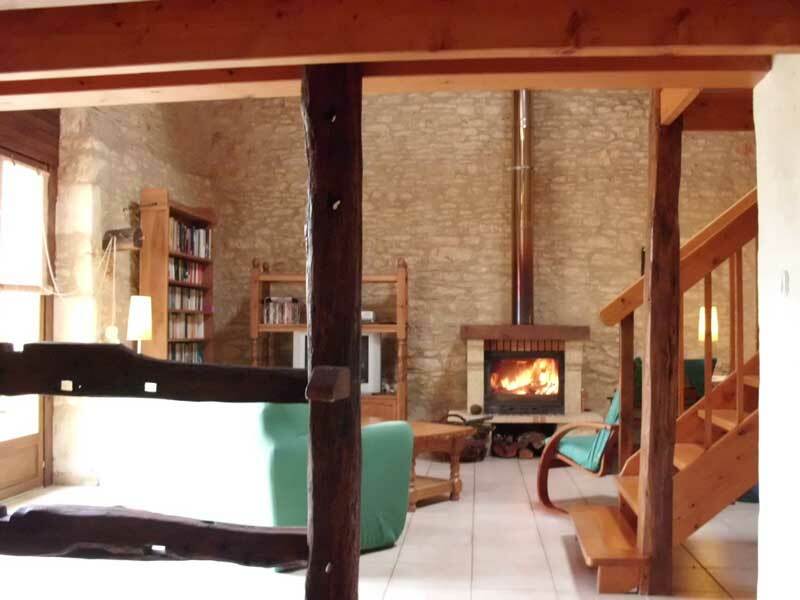 Under-floor heating and an enclosed log-burning fire to ensure a cosy ambiance for out-of-season rentals and winter breaks. Open-plan living/dining area with large glazed doors opening onto the sunny courtyard. A covered dining and recreation area outside the kitchen, under the arch. TV with Sky digibox (free-to-air channels) and French channels TF1, France2 & 3, Arté, etc. plus DVD and video players and selection of films in English & French. Free Wifi access to satellite internet is available for those with a modern laptop, for emails and web. Lots of books for holiday reading. Outdoor games: dart board, tennis, badminton, etc. 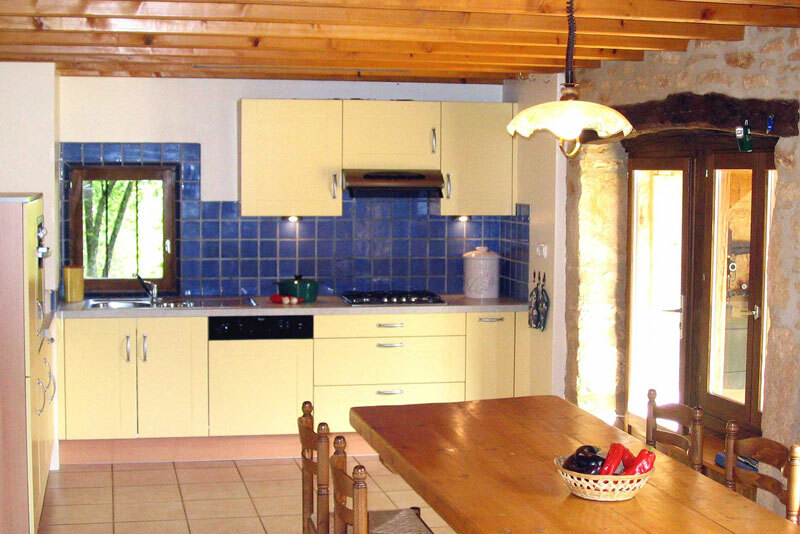 The dining area, two steps down from the living area, has a large pine dining table; the newly fitted kitchen is well equipped for self-catering and has a fridge/freezer, gas hob, electric oven, microwave and dishwasher. 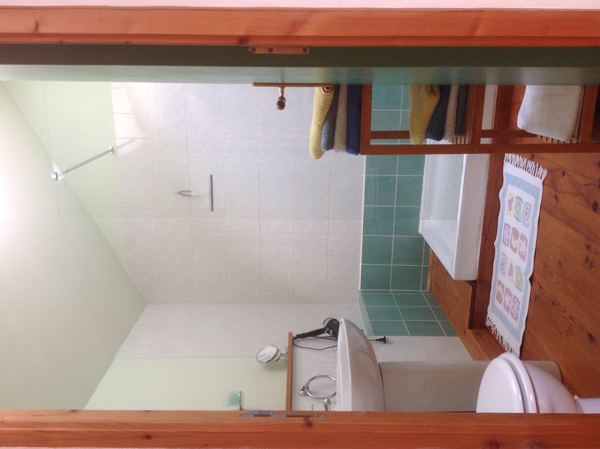 There is a cloakroom/utility room off the kitchen, with a washing machine, tumble dryer and a downstairs toilet/shower. Off the gallery are a bedroom with twin single beds, and a shower room with shower cubicle, toilet, bidet and basin. Guests have a choice of several seating areas, in sun or shade. The covered entrance from the courtyard provides a private sheltered dining area for the Barn, next to the kitchen. 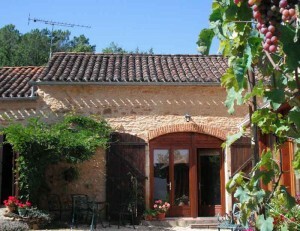 At the back of the gîte an old stone arch hides a quiet sitting area overlooking the orchard. 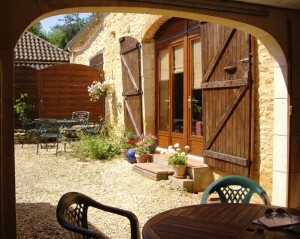 Herb beds in the courtyard are for the use of guests; the courtyard opens onto fields and a small garden area. Across the courtyard, near the barbecue, is a large stone table with chairs for outdoor dining, shaded by day or candlelit by night. The pool is situated at the rear of the buildings, overlooking the fields. Holiday rentals are normally booked by the week, but short holidays or weekend breaks are possible all year round, subject to availability. 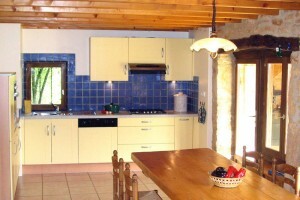 Please contact us for more information and rates for long term rentals. N.B. 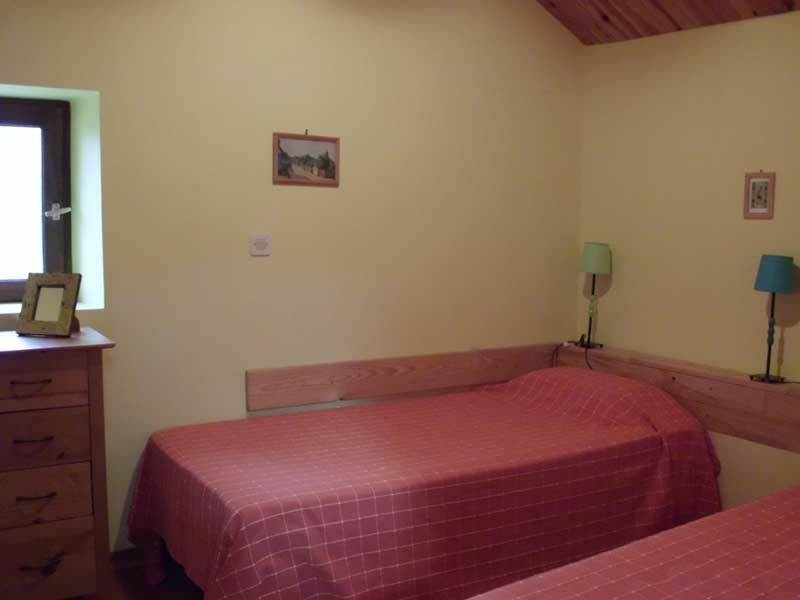 Due to the various changes in level, the accommodation is not recommended for the elderly or infirm; or for very young children, unless well supervised.